I was torn in so many different directions with this ingredient. Do I try to do savory, or submit my pumpkin pancakes previously posted? 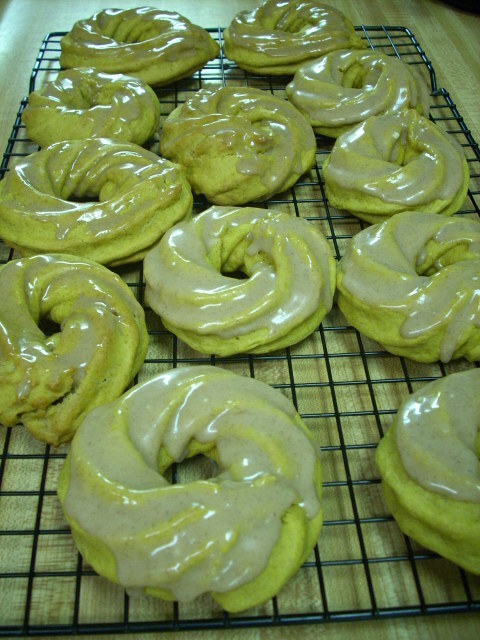 Then it dawned on me – what about pumpkin donuts! 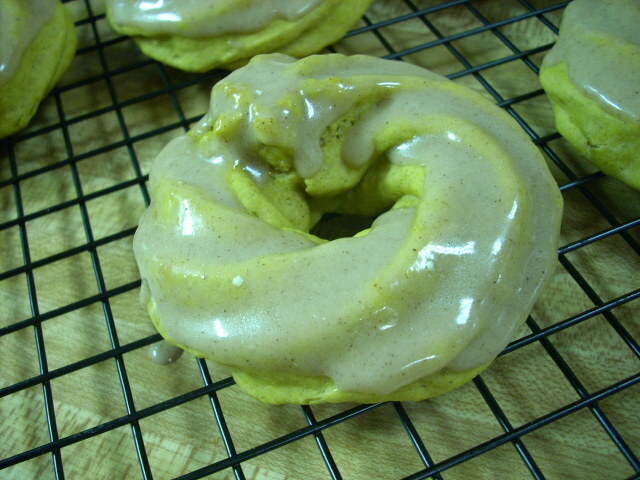 I’ve made donuts before – but simple method. Roll out refrigerator biscuits, cut a hole in the middle, deep fat fry until they float and then toss in sugar/cinnamon combo. Easy, but not so figure friendly. So when I put my batter together, I really thought it would be thick enough to roll out and use biscuit cutters to make the donuts. Um, no such luck! Then I thought, I still have the piping bag from when I made churros the other day, and decided I had nothing to lose! In a medium bowl, mix together flour, brown sugar, baking powder, pumpkin pie spice, salt and baking soda. Ad pumpkin, eggs, milk and shortening. Beat with an electric mixer until mixed. Spoon the mixture into a pastry bag and pipe onto cooking sheet sprayed with Pam. Bake in a preheated oven at 375 degrees for 10 minutes, or until golden. Mine took exactly 10 minutes. Cool on a a wire rack. Mix together until smooth. This was enough to frost all 12 donuts – the whole frosting recipe comes in at 260 calories, 2 fat, 60 carbs, 0 fiber, 1 protein. Not too bad and so delicious! This weeks host is Lindsey at http://loveofoats.com/. We’ll see what happens! See you tomorrow!